Mirik is a small and sleepy hill town in Darjeeling district, 49 kms (i.e. 30 miles) away from Darjeeling town. It takes about two and half hours by car to reach Mirik from Darjeeling. A road from Ghum goes to Sukhiapokhri, a busy hill township located 11 kms from Ghum. 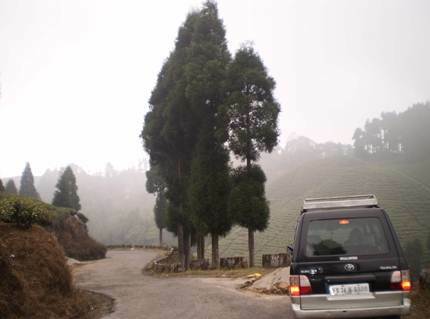 The road continues to Mirik through scenic tea gardens and lovely mountain landscapes. So what do you experience during this day trip? It's a wonderful scenic drive through tea gardens on hill slopes. You will pass by the famous Thurbo Tea Estate of Goodricke as well as several others like Gopaldhara. On the way you will also see a lot of orange orchards. If you start early and have a reserved car, in a short 2 kms uphill drive from Sukhiapokhri you can reach a Beautiful place - Jorpokhri. This tiny place on a hill top has twin lakes, surrounded by forest and offers magnificent views of Kanchenjunga. This is where you can see the rare lizard like creatures - the Himalayan Salamanders which were once considered extinct. Spend some 45 minutes at Jorpokhri soaking in the views and walking around the lakes and forests. You can also visit Jorpokhri on your way back from Mirik. You will need to come back to Sukhiapokhri market area. And then in about 20 minutes from Sukhiapokhri, you will reach a wonderful view point called Simana - a 60 feet by 40 feet plateau and a viewing area. Simana in Hindi means border. This is the Indo-Nepal border area, the road itself belongs to India and the viewing area falls in Nepal. But you can freely cross over to get the views. You can see Maneybhanjan below and the beautiful mountains on a clear day. 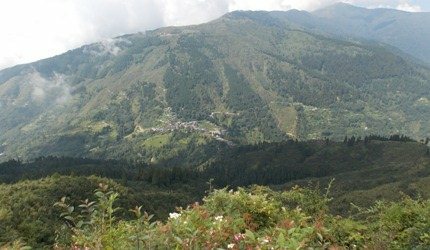 You can also see the narrow winding road leading to Sandakphu on the other side of the valley. Look to your right and you can see the dazzling Kanchenjunga snow peaks. View of Maneybhanjan from Simana. You can also see the trail to Sandakphu. From Simana for a long way towards Mirik, the road acts as the divider between India and Nepal. On both sides, the people, their language & culture are the same. They are all mostly Nepalese. but strangely their voters identity cards show different countries in their addresses. They all move freely across the border (which is the road itself). In fact many families have marriages across the border and have their in-laws' houses face to face but at the opposite side of the border. Next to Pashan Lamu is the stall of Usha Chettri. 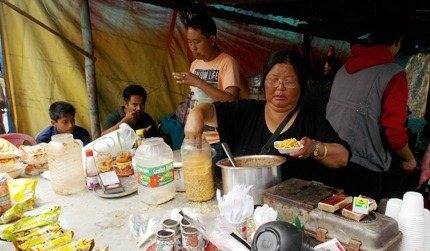 Like several others, she sells all kinds of chocolates and candies that are brought from Nepal, as well as water and beers (as you can see on her table and right in front). Take one or two packets of chocolates. They are not expensive. But they look nicer than they taste though. If you show interest, be sure that you will be sold some items whether you like it or not. They will keep persuading, and if you buy from one, others will also keep requesting. Don't be surprised to hear comments from some of these women like "Itna bolnese to bhagwan bhi kharid leta" which means "Even God would have bought by now after so many requests"; and some other lady will say "Nepal me akey to kuch lo" ('having come to Nepal, take something'). Usha Chettri - All Smiles! Further down, you will reach Pashupati Market entrance at the India-Nepal border. The main market is about 1km walk from the border. You can either walk or take a Nepal taxi at the border to reach the main market (Rs. 200/- for round trip). Alternatively you can take your own vehicle, complete a vehicle permit formality at the border check post and pay the permit fee for the car (permit charge is around Rs. 350/- for a vehicle). There are few shops right across the border which you can check out in case you do not want to go all the way to the main market. 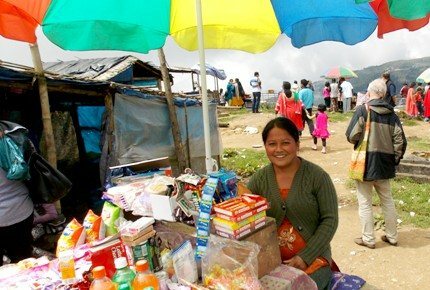 Once you complete formalities with the border security (which is usually a quick process), you will get to the road in Nepal that leads to the main market. This road continues all the way to Katmandu. Cameras are not allowed inside. Note that only Indians and Nepalese are allowed to cross over the border area here. Foreign nationals are not allowed to access this border. You are required to carry Photo ID in case you want to cross over the border and visit the shops. The market is full of imported electronic gadgets, jackets, perfumes & cosmetics, accessories and clothes. Be careful about the fakes. Many items sold here are too cheap to be good. You can also visit the market on your way back. Having visited Simana and Pashupati Market, as you move on further towards Mirik, you will come across lovely landscapes full of tea gardens on your left. There are several small round hillock formations with pine trees on top making it a picture perfect site. This is Gopaldhara Tea Estate. In fact you can walk down the isle through the tea gardens and reach a view point from where you get wonderful view of the gardens all around. And here on the opposite side of the road is Gopadhara Tea Stall. Halt for a while to taste a cup of tea. The tea is prepared to perfection by a lady and served in a transparent cup so that you can see the color. If you haven't yet tasted green tea, this is the place to try that. But you should not mix milk or else you won't get the authentic flavor. The tea served here is from Gopaldhara Tea Gardens. In fact you can also buy packaged tea of the gardens from here. I do so whenever I am traveling on this route. They have different brands... the black tea sold with maroon cover is good for getting colors as well as nice flavor. There is toilet facility here. The stall also sells packaged snacks. Mirik - A small hill town is located further 12kms from Pashupati Market and at an average altitude of 5,000ft. 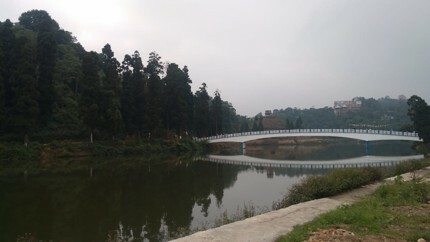 After reaching Mirik, first visit the Mirik Monastery on top and then the Mirik Lake. These are the top attractions of the place. There are separate bus and car parks on the right side of the lake on an open flat area. Sit along the bank of the lake and relax. You can also do boating in the lake (mostly paddle boats). Or walk over the arching footbridge and crossover to the other side (western bank) of the lake, turn left and take the walkway through the dhupi forest and enjoy the nature. There is a temple in the forest (known as Devi Sthan). Pony rides are also available around the lake and quite popular with children. On the eastern (right) side of the lake, there is a flat land and number of small stalls and restaurants. The stalls have colorful umbrellas and chairs laid out where you can relax, have some momos or chaats and fresh tea. Several stalls here sell curios, soft toys, gift & souvenir items, clothes, hats etc. Update October 2014: The flat open land area at the eastern side of the lake has been converted into a fenced garden with many flowering plantations. There is no entry fee. It's a good place for families to sit and relax, or enjoy a picnic. The Day Center is on the eastern side of the lake. It has a nice seating area and you can have tea, snacks or lunch here. The Day Center is operated and managed by GTA (erstwhile DGHC). On the right of the Day Center you will see Park Hotel & Restaurant. The restaurant here is also quite popular for tourists and serves Indian & Chinese dishes at budget prices. But the preparations are quite ordinary. 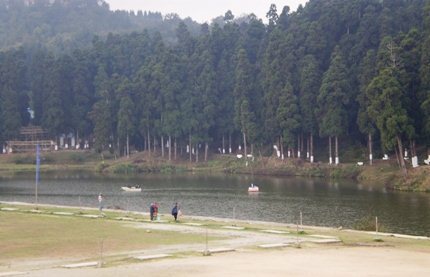 An interesting activity in Mirik is to feed the huge quantity of fish that teem the pond right opposite of Mirik Lake. A lady sells bread slices (10 INR for a loaf) right beside the pond and almost every tourist who now visits the Lake Mirik throws bread crumbs down into the lake and the rather huge population of fish jump up to devour it ravenously. The fish are happy, fat and get food for free and it’s interesting to watch fish eating… Bengalis feed their prey for a change!! 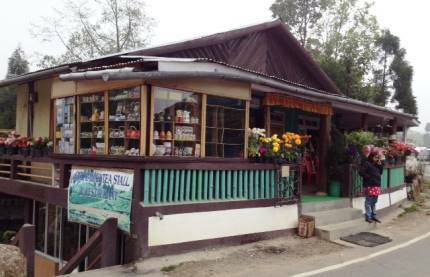 For lunch, one of the best places in Mirik is the restaurant at Hotel Jagjit. They serve multi cuisine dishes and specialize in north Indian items. It's in Krishnanagar and a short walk from the lake. I have stayed in Hotel Jagjit several times and have seen both the hotel and restaurant being upgraded and expanded over the years. It's a mid-scale restaurant, clean and reasonably priced for its standard. You will get toilets and washrooms there, as well as their own departmental store to by essentials. And if you are a Bengali, you must be looking for fish. Just walk down towards Krishnanagar (2 minutes from the lake) and you will see couple of restaurants Annapurna and Kolkata Hotel (formerly known as Baudi's Hotel). They serve all kinds of Bengali dishes including fish, mutton and chicken preparations. After lunch, take a walk along the trail that goes by the right bank of the lake and you will reach a stony stairway at the end. The stairway leads to the Mirik market at an upper level. 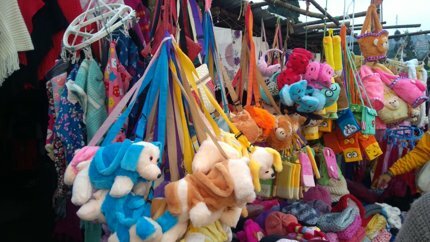 There are number of small shops selling all kinds of items including woolens, clothes & souvenirs. Spend some time here before you start your return. On your way back to Darjeeling, try to cover the lovely Mirik Monastery which you can see on a hill top from the lake area. Read: Sightseeing & Tours at Mirik for more options & activities in Mirik. 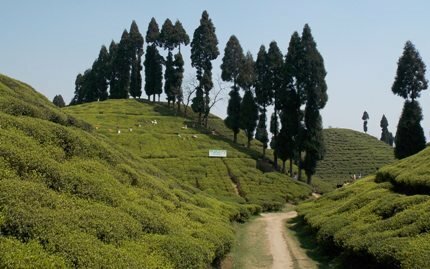 Mirik is about 49 kilometers from the town center of Darjeeling. You can hire a cab (private taxi) from one of the taxi stands in Darjeeling. You will get ample taxis from either the Clubside Taxi Stand (across Gandhi Road Police Point), or at Chowk Bazaar area. It takes about 2.5 hours to reach Mirik. Alternatively go through a Tour Operator, you can then expect a car in good condition and an experienced driver, although the fare may be a bit higher. You can also take a shared jeep or a bus from Darjeeling and save on cost, but in that case you can not cover Jorpokhri or halt at Simana, Pashupati or other places. Shared Jeeps and buses are available from stands near Chowk Bazaar (lower town area). Check Fares from Darjeeling to know about all the modes of transport available from Darjeeling to Mirik and the fares including the day trip. 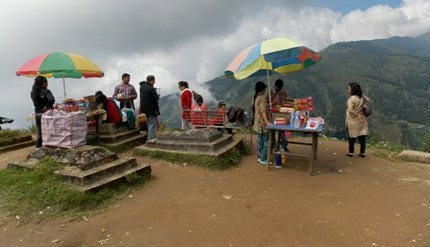 1) Check out Day Trips & Tours from Darjeeling for many other great day tours from Darjeeling. 2) Check out Darjeeling Tours to know about many other wonderful places that you can visit from Darjeeling within hours. Hi, I would be visting darjeeling during last week of April 13. I was told that Nepal border is quite near and is a good place to visit. Can you please elaborate on that? The nearest Nepal border is about 30kms away from Darjeeling town towards Mirik (via Sukhiapokhri). There is a Pashupathi Nath Market there (across the border in Nepal's side). They allow you to visit the market and get back. You get many electronics, clothes and other foreign goods there.